Is Your Boat Safe on its Trailer? Outboard engines went through a major-league change, when modern four-strokes hit the market (See Outboard Smack-Down: Two-stroke versus Four for more on the topic). They became more fuel-efficient, more reliable, quieter, and better in just about every way – except weight. Evinrude kept flying the two-stroke banner, with direct-injected ETEC outboards that had most, if not all, of the four-stroke advantages. But for the past decade or so, outboard engines have remained more or less the same, with mere minor tweaks and improvements. That’s changing right now, as Evinrude has just introduced ETEC G2. 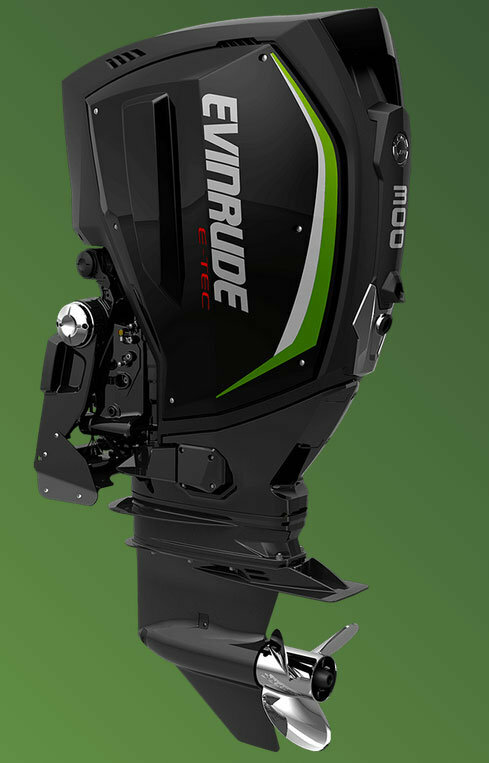 The new Evinrude ETEC G2 outboard, from BRP. No, the picture isn’t sideways. As you can see, the G2’s profile is quite different from the old ETEC – or any other outboard, for that matter – because the old cowl has been replaced with a composite exoskeleton. Evinrude claims the G2, a 74-degree V6 powerbead, produces 20-percent more torque, 15-percent better fuel economy, and 75-percent fewer emissions. To gain these benefits Evinrude stared with a blank sheet of paper (or, more likely a blank computer screen) and designed this new engine from the ground-up. In fact, with a few exceptions the G2 doesn’t even share the same parts and pieces as the old ETEC. Along with the powerhead, the other sections of the engine are also all-new. A new mounting bracket incorporates the steering ram, an electric boost motor adds power steering, and also incorporates the rigging tube. Naturally, the whole package is designed to integrate with modern fly-by-wire controls. An added benefit here is that the shift actuator can be included in the gear-case, eliminating the (commonly troublesome) shift linkage. The gear-case also has a lube-level and water contamination indicator, eliminating the common worries about lube oil. Just how confident is Evinrude in the new G2 ETECs? They’re stretching the scheduled maintenance plan out to five years or 500 hours. That’s incredibly convenient, especially for those of us who live hours away from the dealer. Long-term storage and break-in is all computer-controlled, so you don’t have to worry about those details, either. If you want to learn more about these new Evinrudes, check out this “Outboard Expert” article by Charles Plueddeman; he ran these engines and did an excellent, more detailed evaluation of the G2, as well as shooting some video. Or, visit the Evinrude web site.